A couple days ago I was giving healing to a friend and got to thinking. I've had a neck, shoulder and back ache for almost a week and it was really getting on my nerves. It hasn't been strong enough to immobilize me, but there it was like a consistent annoyance in my life. I was grounding my friend and was overcome by a wave of self-pity, wishing I had someone to heal me when I needed it. We have this saying in Mexico, where the shoemakers family are the ones to go barefoot. And the cook's kids are the ones to go hungry. The past couple of weeks I've had the depressing idea in my head that I can't heal myself as well as I heal other people. And I was wishing someone would stop by to heal me, once in a while. Granted, we do practice on each other in class and I've been having weekly distant healings. But I was in a pitiful mood and I wanted someone to come to my house to heal me [cue the violins]. People get into healing for different reasons, I was driven by recurrent stress aches that were making my life a royal pain. Two years ago I had just moved to London and was looking for a job. I didn't want to admit it, but the stress of the move was getting to me and it was taking a toll on my back. For a few weeks I kept making trips to Boots Pharmacy to buy Pain-Eze, but eventually my desperation drove me to the Mind-Body-Spirit section at Waterstones. I was determined to cut if off at the root, and end my back aches once and for all. I walked down the stairs and saw the blue potion-like covere of Petrene Soame's book, even before I reached the shelf. Just look at the title, it was everything I wanted: The Essence of Self-Healing: How to Bring Health and Happiness into your Life. The cover is a bit wishy washy. I was a little bit embarassed to take this to the register and pay for it. I think its because all of this mystical stuff still feels very alien to me. The content is fantastic, it was the first time I heard the idea that we choose to be in ill-health. But the cover was too much for me, with its sparkly potions. Still, I think its beautiful. This afternoon I met some friends for lunch in the Notting Hill area. We walked up and down Portobello Road looking for a new pizza place, which turned out to be booked. The search for a restaurant continued for what seemed like ages, and all along I felt a little pain in my back and legs as we walked. After lunch we went to the Victoria & Albert Museum to see a great photography exhibition about life in South Africa. There was a very vivid still shot of a red-headed man in one of the shots at the end, he looked so alive and I could almost see him stepping out of the picture and into the hall. I think he must have had a personal relationship with the photographer, otherwise I don't know how they could have captured his essence so well. I stood there looking at the picture, with my purse slung over one shoulder and weighing on my back. All along I had this slinky feeling in my spine, I swore the red-head knew I was in pain [that was a very Harry Potter moment, I have a vivid imagination!] After the exhibition we each went our separate ways, I stopped by Harrods to get Lebanese candy and then caught a bus home. The bus dropped me in front of Waterstone's and without thinking I walked into the store. A massive pile of books greeted me in the entrace and I remembered the ones I have sitting on my shelf and in my Kindle, un-read. I turned and left. To my surprise it had started pouring in the last three seconds, and I was six blocks from home with no umbrella. That left me no choice and I went back in to the Mind-Body-Spirit section, looking for a book to read until the rain finally stopped. 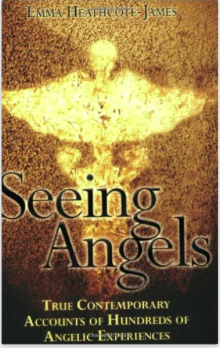 The first one I picked up was called Seeing Angels , it took me about twenty minutes to flip through dozens of testimonials on angelic encounters. The woman who wrote the book is an agnostic theologian, and she was interested in documenting trends that made it big in the US before coming to the UK. When she started the research she thought Angels were a trend that would blow over, going on to say that they only went mainstream in the 1990's when they started exploding on bookshelves and TV in the US. Before that angels were in the Bible, and people assumed that they were a thing of the past. Or that you had to be Moses or St Joseph to see them. Not anymore, her book is filled with dozens of accounts, there are lots of similarities in the accounts. 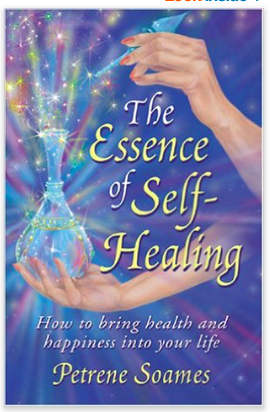 There was a chapter on healing that got my attention, one of the things I've been interested in is how we can ask angels to help with the energy healings. 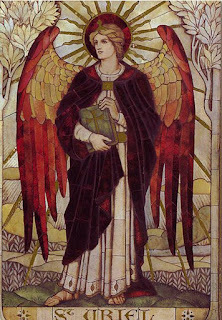 At one point she touched on Archangel Raphael, and his work with doctors, healers and other health care practitioners. A light bulb went off in my head and I remembered seeing a Doreen Virtue book, I went back to pull it off the shelf. For some reason, I can't stand Doreen's voice, so the radio show and the guided meditations really off limits for me. But the books are great, I already have one on Archangels and Ascended Masters. The one on the shelf today was called The Healing Miracles of Archangel Raphael, I flipped to the back as I sometimes do with reference books. The last chapter was filled with short prayers for specific afflictions. They were all addressed at Raphael, and would include the emotional trigger that is supposed to hurt that part of the body (or life). For example, I looked up neck pain and it said something along the lines of: Dear Archangel Raphael, thank you for healing my neck and restoring flexibility so that I can see my life clearly in all directions. This struck a chord with me, because when I started to get my stiff neck and upper back last week I remember thinking that I couldn't look at myself. I was OK if I was sitting up straight and staring straight ahead, but if I dropped ketchup on my shirt I would have to go stand in front of a mirror to look at my shirt. When I read this little prayer the message for me was that the neck pain was caused by my control issues, my metaphoric inflexibility and not wanting to take a look at myself. I had been too focused on doing readings and healings for others, and I was ignoring my own needs. So I resolved to take a break and pay close attention to what's going on in my life. Once again, I'm convinced that any dis-ease is how our body and soul commmunicate with our conscious self. My goal is to listen and make sure I sort things about so I can stay healthy. After getting an answer on what was causing my neck pain I turned to the front of the book and started reading. It was still pouring outside, and this is where I was supposed to be on the rainy afternoon. The book went on to discuss all of the things that Raphael dedicates his time and effort to, primarily health, healing, and helping other heals. He guides doctors and nurses in their career paths, and if we ask him to remove our pain and our illnesses he will also help with that. There were a few testimonials at the beginning from people who asked him to step in and heal their illnesses, and the way they describe the tingly hot sensations is exactly the way we experience distant healing. So another light bulb went off in my mind! 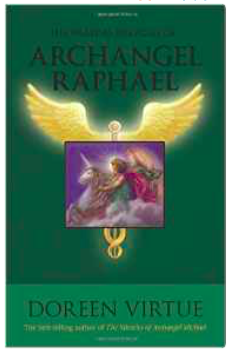 Archangel Raphael is the super-powerful healer that I can call on when I need to heal myself. Sometimes its great to have someone else do the work, trying to channel light and and heal my own neck was a pain. I'm not going to cover the book in length, I managed to read through most of it and by the end I was sold on coming home and asking Raphael to help me with my neck and back. The rain had stopped by the time I was done reading the book. I came home and lay down on my bed, asking Raphael to come to my room and heal me. At first I closed my eyes, but I got the feeling that I should keep them open. I could sense him standing huge at the foot of my bed, and the first thing I felt was a light brush against the bridge of my nose. Usually I will feel something like a feather on my cheek or my nose, some people feel hands on their shoulders or over their crown chakras. The feather-sensation disappeared and I started to feel warm energy all over my feet. It spread until it covered my left side completely, and then engulfed the right side. I could feel shivers up and down my spinal column, up my neck and down the back of my leg. My left leg started to throb as well, that's where I had a DVT a few years ago and it will still bother me occassionally. The sensations were really strong for what seemed like half and hour, then I fell asleep. I woke up two hours later, my temperature had dropped and I was freezing. My right ankle still had a little sprain, but the rest of me feels much better. I can still feel a little crick in the neck, and I think it will take a couple sessions. No doubt there is some emotional instrospection to do, to make sure the pain goes away for good. The pain in my back is usually a small nagging sensation, unless I ignore it and then in balloons into something bigger. It usually appears when I'm stressed or bummed about something that I am turning a blind eye to.